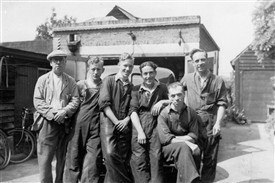 Roughton's garage that was in South Street as mentioned in previous posts was originally owned by my Grandfather Hugh Roughton and his brother Wallis (known as Walla). During the war years Hugh was in the RAF (Spitfire mechanic) following his squadron in North Africa & then into Italy whilst Wallis remained at home manning the shop. Unfortunately Hugh died in 1956 leaving Wallis to run the garage on his own and I never got the chance to meet my granddad, although I still have some old tools that belonged to him. Round the back of the garage lived Percy & Lottie Roughton (Hugh & Wallis's parents) and two aunts Effie & Lyle who I can remember visiting as a youngster. The two aunts lived in two little cottages with flag stone floors and tiny little kitchens whilst the others lived in a much 'posher' house across the yard. The workshop was just a pile of old car parts around the outside against the wall up to almost head height with whatever car was being worked on in the middle of it all. Was it re-cycling 1960's style? Ted Perrin also worked at the garage for all of his working life up to his death except for a break in the army during the war. They also supplied fishing gear & bait and I was once told a story that one day Wallis went down to the cellar to get some live maggots for a customer to be confronted by a swam of flies one hot summers day, they had all hatched out! 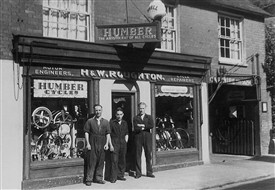 They also sold & repaired bicycles and I got my first proper 'big' bike from the garage, not sure if my Dad got any discount though! This page was added by Mark Layton on 16/02/2015. Hi Patricia, sorry to have taken so long to reply. I do remember you from Rochford junior school, there are a few others, Pat Wellington, Jean Fitch, Richard Vaughan, Daphne McClaren, Peter Cottis, John Whittigham, Cynthia Edwards. Moved away from Rochford when I was 18, now living in S.W. France. My family always got their bike bits at Roughtons. When the siren went off Mr Roughton would come out of the garage on his bike to go down to the fire station. Hi Jennifer, I gather from what you have written above you were Jennifer Roughton. We were in the same class at school either at Rochford Junior or Rochford Secondary Modern, maybe both. I recall your name it was just to say hi. My maiden name was Hunt. Wallis was my father, I have some photos of Uncle Hugh and my grandparents. Goodness! I'm Wallis' granddaughter. What a small world, does that make us cousins of some sort? As previously mentioned I worked there in the early 1980's when it was a bike shop.